If you are expecting twins or you just brought home your double bundle of joy, congratulations! We understand that even though you are ecstatic to have the most adorable twins at home, you are wondering how you will care for them best? How can you monitor them with ease? Is the nursery’s design ideal for easy monitoring? Well, you can take a sigh of relief because we are about to make your life less stressful. We are introducing to you the most-recommended baby monitor for twins. Being a mother of twins, we went through a big challenge finding the best monitor for our twins. It took us time to determine the best but after our experiences, research and the experiences of others we know better. Baby monitors make it possible for you to rest peacefully. Unlike earlier years, there are better quality monitors, and if you are wondering if you need to get one or two monitors, then you are in the right place. In this review, we’ll take you through all the essentials to look for in monitors. We know that you love your little angels with every bit of your tired body and we’ll make things better. If your house isn’t a mansion or too big, you may argue that you don’t need to get a baby monitor. But, just think about it for a second, can you tell what the kids are doing when you are in the living room or the kitchen? Things go south fast with kids and a monitor lets you know whatever is happening in real time. The monitor enhances the safety and security levels around your twins when you step out. For the peace of mind that comes with a monitor, you’ll feel better with it in the nursery. Should you get an audio or a video monitoring system? An audio monitor may seem like an excellent idea when you don’t have to stay too far from your kids but, a video monitor lets you see what they are doing. You can watch them play without disturbing them. Even though the video monitor feels great, you shouldn’t rush into buying any that you see. Get a digital rather than an analog video camera. Hacking into an analog camera is easy. The digital camera will be a splurge but a worthy one. Though expensive, the best will offer the best level of monitoring. You should also consider getting a multi-camera rather than a single camera. A multi-digital camera has systems for movement sensors, night vision, and the cameras may be movable too. These tech features will let you know all that is happening at all hours of the day or night. Regarding the range and the signal, these baby monitors will cover the entire house, and the signal won’t be weak. The monitor should not go off every few minutes, and it should be clear all the time. Note that the range on the monitor’s box may not be the actual range of the monitor. Check out user reviews to learn the true range of the monitor’s signal. Though not very important, you should consider looking at accessories like visual crying alerts, movement alerts, and temperature gauges. Can you travel with the monitor if you need to travel often? Can you afford that nifty monitor you have your eyes on? Having used this monitor for our twins, we can attest that it is our favorite. It has a sleek and a compact design which makes it perfect to move around or when traveling. This monitor guarantees to offer you peace of mind as your twins sleep or play. It is one of the best on the market and looking at its ratings from other users. It is an excellent choice. Even though you have to buy the wide lens separately, the features of this monitor do not disappoint. This is the first baby monitor for twins with the interchangeable lens technology, and videos stream in real time to the slim 3.5inch LCD color display. This DXR-8 lens technology makes it possible for you to customize the performance of the camera by switching between different camera lenses in seconds. You can select the preferable focal length plus the viewing angle depending on the environment. It, therefore, has a professional touch. Close-up light vision works best for night time, and when your twins are active, you can use the panoramic lens to check their activity. The normal setting has mid-range coverage and lets you know if your babies are safe. On the other hand, the zoom option lets you know how your babies are doing when sleeping. The best part is that the optical zoom doesn’t deteriorate the images’ resolution. The wide angle lens bought separately offers a 170 degree full panoramic view. It is also safe thanks to the 2.4GHz FHSS wireless transmission which assures you of privacy and delay-free audio and video playbacks. You can control the cameras remotes and discreetly and you can also carry it with you. This DXR-8 monitoring unit is chargeable from any USB outlet. The sound activated LEDs lets you know when your babies are crying or whimpering, and you can tell when to check on them. The volume is adjustable. It has an interchangeable lens technology. It has a temperature sensor. You can remote pan/tilt/zoom the camera. Picture & voice are very clear. Expensive price but totally worth it. Wi-fi and microwave can interfere with the signal. The worst days of mom’s life are the ones immediately after the end of the maternity leave. Even if you take a year long, getting back and being away from your twins is scary. But, it shouldn’t be too hard when you can check on your babies with a click of a button on your smartphone, right? Well, this Palermo baby monitor is what you need for that to happen. It is a favorite for most of us since you will be able to see, hear and even speak with them with the help of the two-way audio feature. Once connected, the monitoring video camera stays connected to your Wi-Fi, and it doesn’t freeze. The camera’s image quality is high, and it will be clear all day and night. You can also pan it to 355 degrees or tilt it at an 110-degrees angle. You can see 32 feet into the night thanks to the use of infrared technology and motion detection technology. Unfortunately, the camera only works best on the normal settings. The 2.4GHz doesn’t support 5G HD systems. Besides watching your kids, the camera will help you monitor everything happening in your home. You can set it up easily using your Android of iPhone device. You can also connect the camera’s Wi-Fi to the smoke alarm and door or window sensors enhancing your home’s security. The image quality is good both in light and dark. You can remote pan, tilt, and zoom the camera. It connects to iPhone and Android devices, you can check on your twins remotely when with the sitter. Great operation when connected through Ethernet cable. Installation manual could be better. 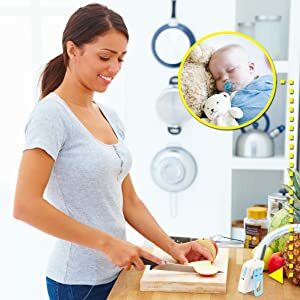 This wireless baby monitor is exactly what you need to monitor your babies from every room you are in. It has a long signal range, and you hardly have to worry about not knowing how your babies are doing. Unfortunately, there are complaints about the range. One of its unique features is the clear two-way audio communication system. Once your twins grow and start talking, you can communicate with them easily as if you are in one room. Its upgraded 2.4GHz FHSS technology offers good transmission, and you will not have to look troubled at work just because you don’t know how they are faring on or worry about a dropped signal. For you to feel more at home, the monitor has a room temperature monitor, and infrared night vision feature and even better, five built-in polyphonic lullabies that will help soothe to sleep or when they are fussy. The LCD screen has Pan, Tilt, and Zoom functions. The monitor is a 3.5inch diagonal LCD that shows real-time sounds and images from your twins’ room. It also comes with five LEDs on the monitor indicating the level of sound activity in the room. You can see the temperature of your baby room. Offers tight security at the top and bottom of the stairway. Enhanced crystal clear two-way communication. This is a remote wireless baby monitor that keeps you connected with your twins and the sitter from almost anywhere. It has an in-home monitor which has a 4.3inch color LCD screen plus touch controls. The diagonal LCD shows images in real time. It has a signal range of 590feet, and if you get out of range, the alarm beeps. It also beeps if the battery runs low. You can monitor your babies remotely using your smartphone through the Hubble App as long as the app is compatible with your device. If compatible, you will receive motion and sound notifications. It also has a temperature display, and you will also get notifications for temperature changes and when it is too hot or too cold. When your babies are all grown and able to talk, you can use the two-way communication to check on them. You can use this with the sitter too. You can also pan, tilt, or zoom the camera for a better view of the images on the monitor. Free sound, motion, and temperature notifications. Free in-app video recording and image snapshot. The two-way communication works well. The image quality isn’t HD. The charging system isn’t effective. This is one of the best monitors for twins, and you can rely on it because of its safe, secure and private internet connection. Thanks to its dual view digital color video, this monitor can help check on your twins, their siblings and anyone else in the house. The 3.5inch HD color LCD monitor features the innovative split technology which makes it possible for you to monitor activity in four rooms simultaneously. It has a 600feet signal range, and you won’t have to worry about your kids if you step out. The monitor is handheld, and it features an out-of-range indicator as well as slots for adjusting the screen’s brightness and the volume. To know if your twins are crying or playing, you have the sound-activated LED. The monitor is rechargeable, and with the low-battery indicators, you will always have sight of your babies and your home. The Pan, Zoom, and Scan features make it possible for you to check out everything happening in the nursery and every other room. This dual view feature gives an 180-degree view. The picture quality is great during the day and at night. The Pan, Tilt, Scan, and Zoom functions work great. The two-way communication with sound activated LED lights works well. The battery runs out fast. There are more battery-powered cameras which can keep a closer eye on your twins when they are in the nursery, installation is easier, night vision is better, there are better quality video monitors, there is better access thanks to the internet and yes, better monitoring! You no longer have to miss a moment with your twins as well as your toddlers. In this review, we find the Infant Optics DXR-8 Video Baby Monitor as our absolute best baby monitor for infants. It has an interchangeable optical lens capability which is a cool feature that lets you customize viewing of your twins. With this, you can switch between different lenses in seconds. You can adjust the focal length and view angle. It has a close-up lens and a panoramic. The two-way talking system, the temperature monitoring, and the audio on mode screen off are the other elegant and highly functional features of this monitor.